Ahhh, weekday mornings. You gently open up your eyes and decide to lay in bed for a while, as your kids are still asleep and your spouse already set the coffee maker. Wishful thinking, right? If your mornings are anything like ours, they involve packing lunches, fighting with your kids that they can’t wear their Halloween costume to school, and trying to get some healthy food in their stomachs before you rush them off to class for the day. 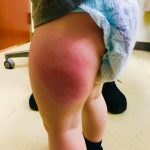 Mom life is B-U-S-Y, so any hacks that can take a little off our plate is always welcome! While some of us may already be in the groove when it comes to meal-prepping our own lunches for the week, it is helpful to do the same for our family breakfasts as well! Not only does this shave off some precious time in the morning, but it also ensures that we can provide our family with a wholesome meal. Once you make the determination to start planning ahead for breakfast, you still need to determine what exactly to make. 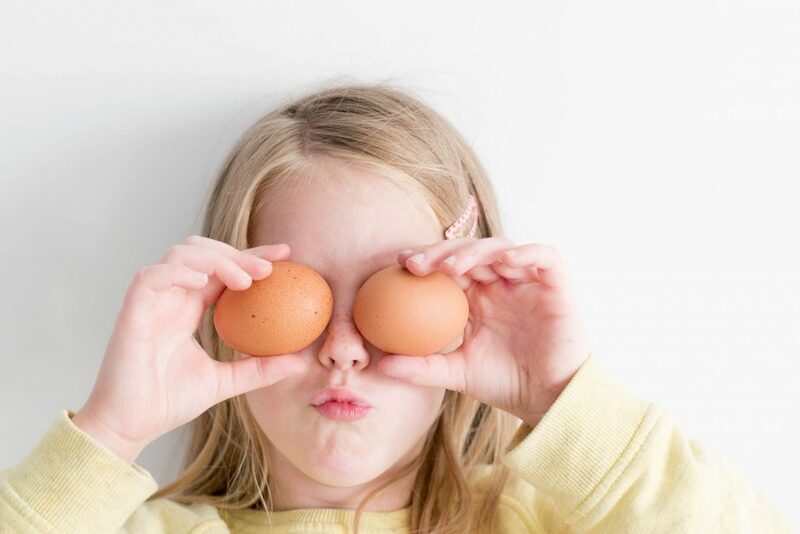 It can be a challenge to get the daily recommended amounts of fruits and veggies into our kids, but we have found that incorporating them into other ingredients they do like increases our chances of success. 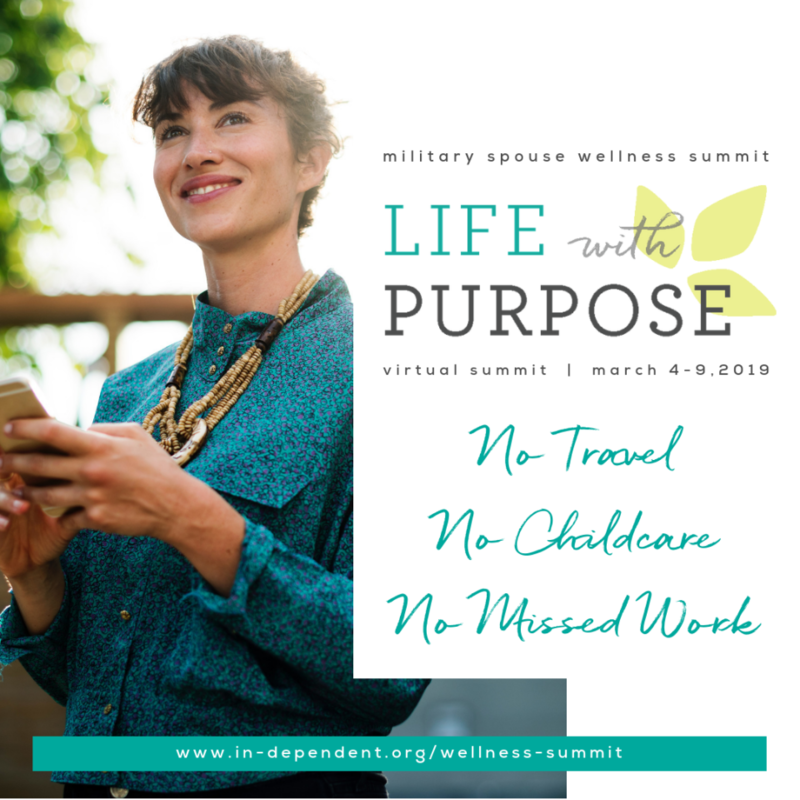 Together with Produce for Kids, Daily Mom Military is working to end hunger and bring families wholesome fruit and veggie packed meals with select DoD commissaries and Feeding America. 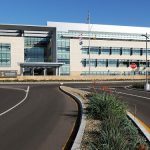 A simple purchase of avocados from Mexico, New York apples, RealSweet® sweet onions, Red Sun Farms Greenhouse vegetables, or Earthbound Farms Organic Salads during your regular commissary trip gives back to Feeding America. The Produce for Kids Campaign features over 450 registered dietician-approved recipes, which helps to take the guesswork out of what to feed your family. 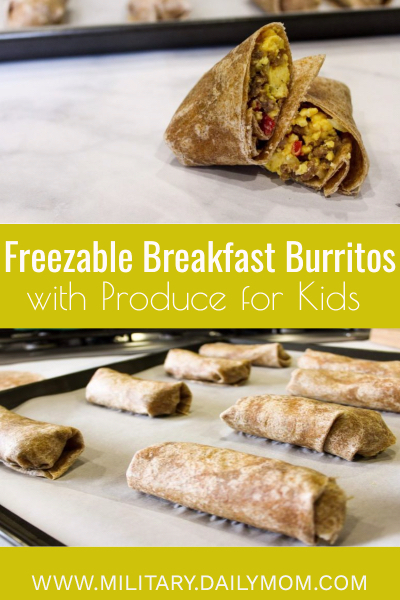 One of our favorites is make-ahead freezable breakfast burritos featuring Red Sun Farms bell peppers and tomatoes and RealSweet® onions, all purchased to benefit Feeding America at our local commissary. 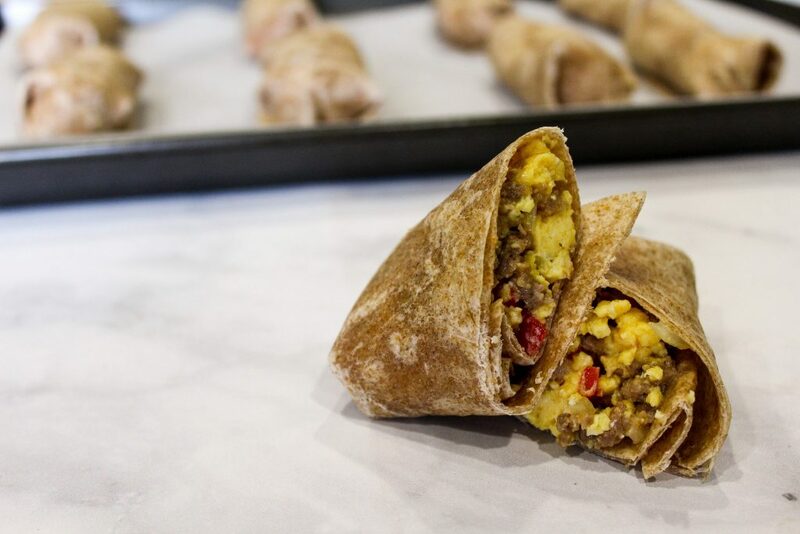 These breakfast burritos are packed with scrambled eggs, fresh veggies, lowfat cheddar cheese, and turkey breakfast sausage, all wrapped up in whole wheat tortillas. 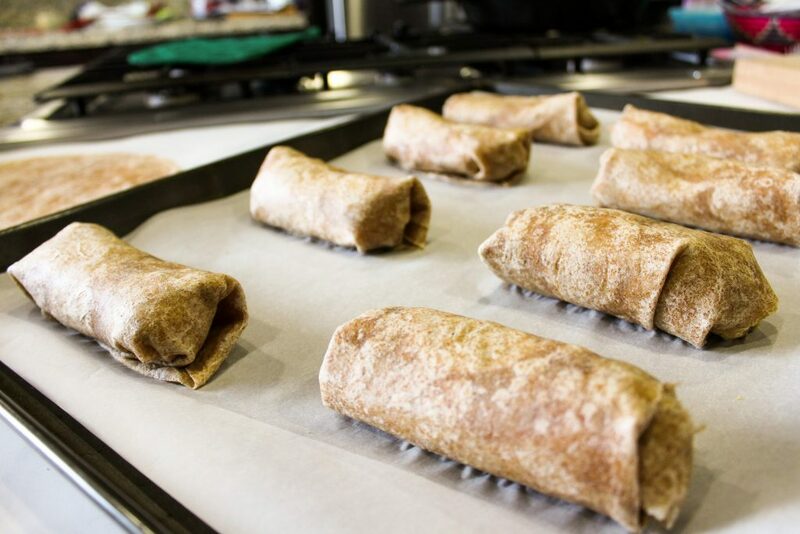 After rolling the burritos, they are frozen individually, making it a breeze to pull one out and reheat. You can make a big batch one weekend, and have breakfast covered for the whole family all week! Check out the recipe below. Heat 1 tsp olive oil in a nonstick skillet over medium heat. Add sausage and cook 5-8 mins, or until cooked through. Transfer to a plate and set aside. Reduce heat to medium. Add 1 tsp oil, peppers, and onions, and cook 3-5 mins, or until softened. Add tomatoes and cook 2 mins. Scramble eggs and pepper in a large bowl. Add to pan and cook 3-4 mins, stirring, or until eggs set. Remove from the heat and mix in sausage and cheese. Let cool. Fill each tortilla with 1/2 cup egg mixture, roll into a burrito, and lay seam side down on a parchment-lined baking sheet. Freeze 1 hour, then transfer to a freezer-safe zip tp bag and return to the freezer. To reheat burritos, remove from freezer, wrap in a paper towel, and microwave on high for 1 minute. Serve a burrito with a sliced New York apple and a side of peanut butter dip for a quick, balanced meal that your kiddos (and spouse!) will love! 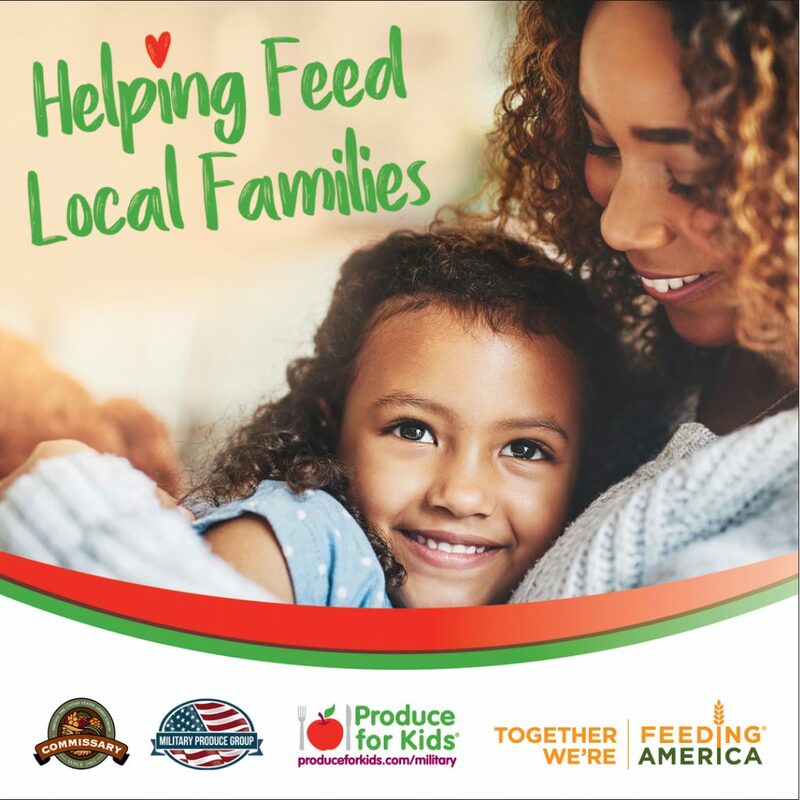 Be sure to add avocados from Mexico, New York apples, RealSweet® sweet onions, Red Sun Farms Greenhouse vegetables, and Earthbound Farms Organic salad to your next commissary run to support Produce for Kids in their campaign with Feeding America. Your purchase will help feed local families and help end hunger for kids in your area. Looking for other recipes? Produce for Kids has 15 family-friendly recipes using some of these sponsored products. Check them out here. Want more information on the Produce for Kids campaign with select DOD commissaries and Feeding America? Check out their socials.